Loyal subjects and soldiers are to be rewarded. Click here to play! The Rajah knows this, as he is a wise and noble leader. He knows his wealth is boundless and that even a meager fraction can change the life of one of his followers. Thus, he often awards great treasures by having his subjects play the Rajah's Rubies game with him. In the Rajah's Rubies slots, you must entertain the Rajah by performing well in the game. All you need to do is line up multiples of a symbol on the same payline, and the Rajah will give you lavish gifts of cash. Line up playing cards, lamps and carpets for smaller prizes. The more serious will line up golden daggers, beautiful maids and bright red rubies. If you line up the 5 of the Rajah himself, then your reward will be talked of for years to come, as the prize for 5 Rajahs on a payline is 10,000 your bet! The Rajah becomes impatient with waiting. Start playing the Rajah's Rubies slots now so that the Rajah may reward you. 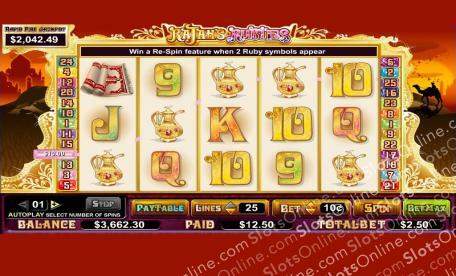 The Ruby symbol is the scatter, and it pays out on the total bet when 2 or more land on the reels. 3 or more on the reels also trigger 10 free spins, all at a double prize multiplier. The Rajah symbol is wild, and is can substitute for any symbol other than the scatter. Autospin can be set from 1 to 99 times, and the game will stop to allow for play of free spins.